Tall and lanky, ungainly, coarse-textured, it’s actively ugly. The bright purple berries fall everywhere and stain everything. It’s a pest. 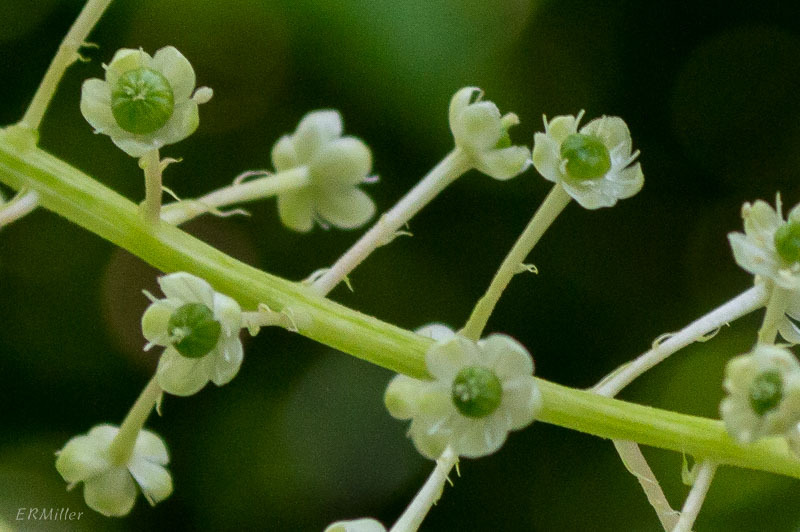 Even the flowers are kind of meh. In 1997 we moved into a new house built on the back 2 acres of an old property, which included the old vegetable garden; over the decades the owner had mucked out a neighbor’s barn once a year and spread the manure there, piled the autumn leaves there, worked in compost every spring. The soil was a gardener’s dream, truly, and I was excited to establish my own garden in it. Except after years of neglect, it was a 32′ by 22′ plot o’ poke. I had someone run across it with a front end loader to remove the foliage, then (optimistic and naive) started to dig out the roots. Did you know that pokeweed roots can go down 12 feet? And that they’re forked and branched and very fat? And yet easily sliced by a garden spade? Imagine a root shaped like a cross between potato and ginseng roots, grown to incredible size like something out of a 1950s science fiction horror film, with radiation. “Attack of the Atomic Pokeweed!” You can’t dig them out. I did get rid of the poke, eventually, by covering the entire area in 4 mil black plastic, which I walked over every few days, stomping on all the bulges. It took most of a growing season to kill the poke, and I shudder to think what happened to the soil biota. 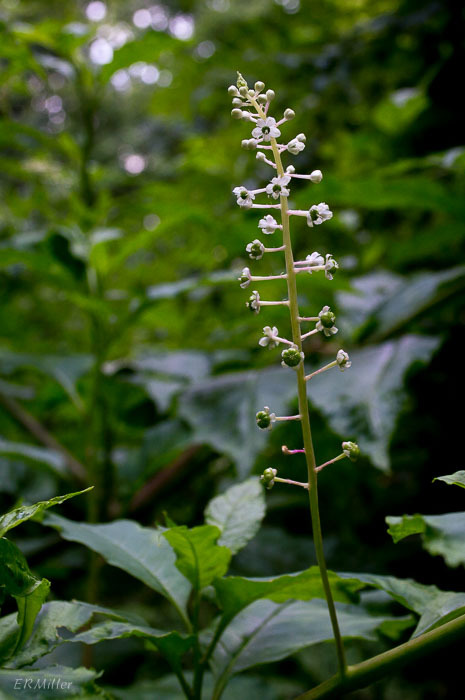 Pokeweed can found in most of the US, except parts of the mountain West and upper Midwest. It’s an herbaceous perennial growing to 8 feet tall. 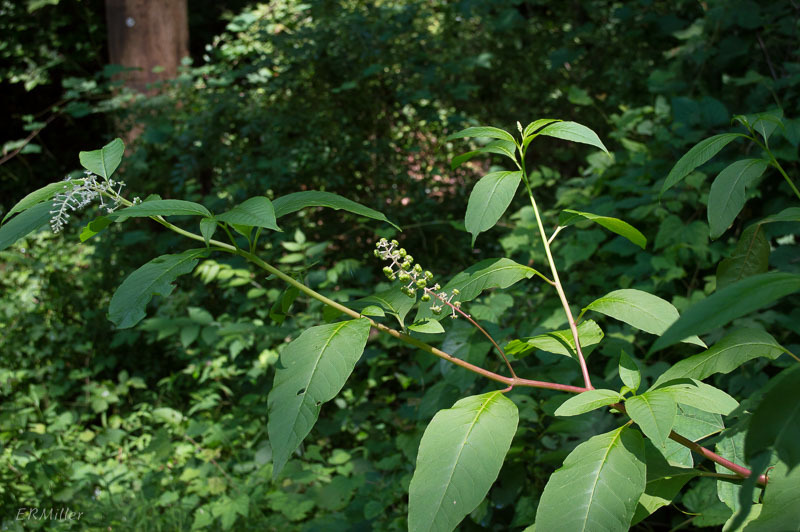 Although native, it’s listed as weedy or invasive by several authorities. Poke does have its defenders, and to be fair the berries are an important food source for a number of songbirds, so the plant isn’t without redeeming qualities. 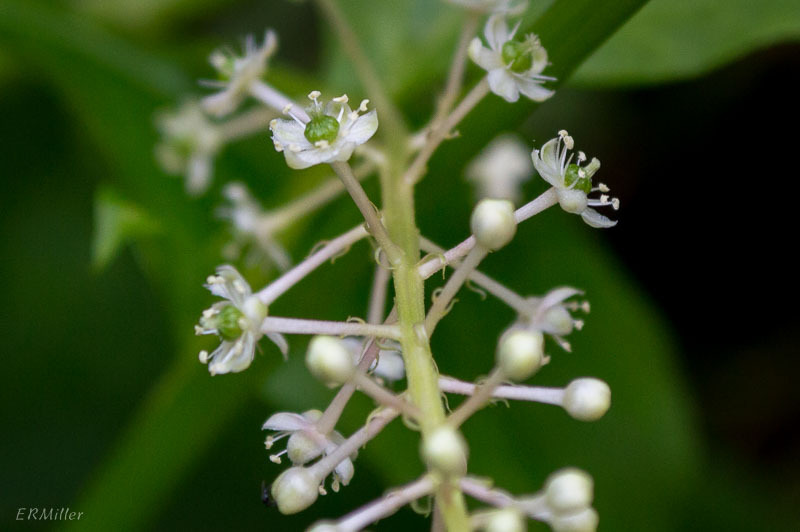 This entry was posted in Uncategorized and tagged Phytolacca, Phytolaccaceae, pokeweed by elizabeth. Bookmark the permalink.